Why Laptop tune-up? Your laptop is like a car, it needs constant care to run smoothly. With basic use and installing and uninstalling software the Windows installation will become bloated with pieces of old software and will slow down your computer. We can tune up your laptop and have it running at optimal performance. Then clean-up the junk from your Windows operating system as well as optimize your computer for the best overall performance for everyday use. Additionally, we will also ensure that you have the latest Windows updates, security software and device drivers. We are a true nationwide provider of Laptop tune-up services, Laptop professional repair services as well as iPhone repair. Besides repairs at our Laptop tune-up, Laptop repair, PC Computers and laptop repair service center in Bellville Cape town, we have tuned up Laptops for customers all over South Africa including Johannesburg, Pretoria, Durban, Kimberly, Bloemfontein, Port Elizabeth, Polokwane, Pietermaritzburg and Nelspruit plus many other South African cities. If you would like to use our professional Laptop tune-up services but don't live close to our Laptop repair service center, click here for information on sending us your iPad for professional repair through our express courier service. 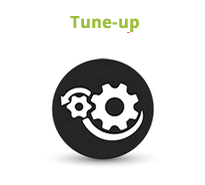 We can usually tune your laptop in 4-6 hours depending on our current workload.